From Mickey and Minnie to Pooh and Tigger, Disney's beloved characters have given us countless gifts over the years - moments of love, laughter and imagination. Now this tabletop Disney Christmas decor brings together Mickey and Minnie, Donald Duck, Snow White and more to deliver the joys of the holidays in your home. 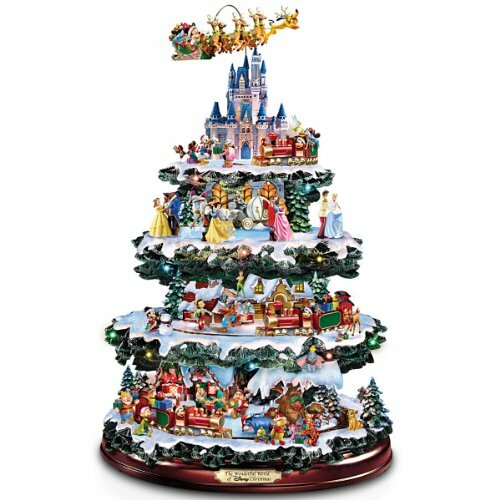 Standing 16" high and decorated with over 50 Disney character figures, this animated tabletop Christmas decoration celebrates The Wonderful World of Disney and is available from Hawthorne Village. With 4 levels of rotating movement on this Disney Christmas decor, the Disney Express seems to "climb" ever higher up the tree, brilliantly lit by 20 LED lights. At the very top, Mickey's at the reins of a Pluto-and-reindeer drawn sleigh that rotates around Cinderella's magic castle. A medley of Christmas carols makes the festivities complete. A fine collectible, not intended for children. The base bears a plaque inscribed with the words, "The Wonderful World of Disney Christmas"